Merlion chocolates, tacky postcards and magnets are things of the past. 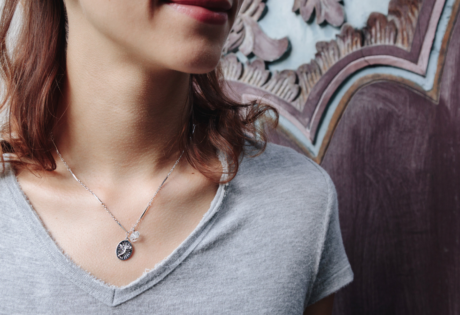 We found you the coolest designs with Singapore style gifts, made by local labels. Going back home for Christmas or visiting family overseas? Or maybe you’re just looking for some #SGPride titbits for Christmas. You’re in luck, there’s plenty to choose from. But first forget everything you know about run-of-the-mill boring as hell souvenirs – and we mean everything from tacky magnets, lacklustre chocolates and postcards with neon text (in comic sans, no less!). And give this list of tasteful and fun pieces with Singapore style a go. We’ve picked from local indie brands a go because we’re all about #supportlocal, of course. 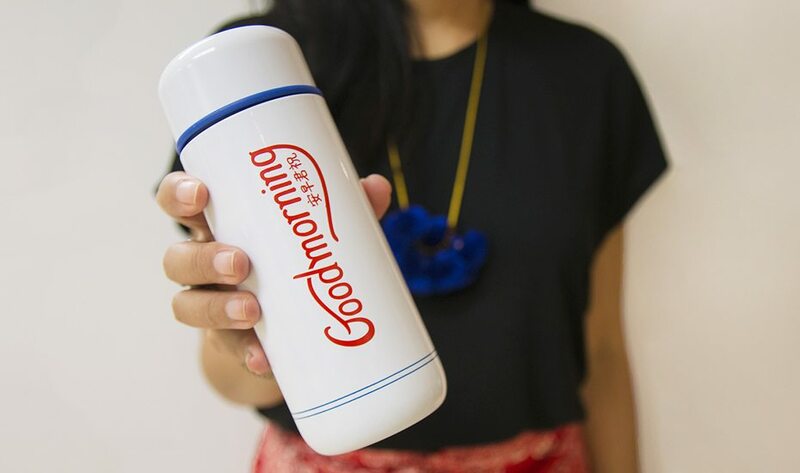 Paying homage to the “Good Morning” towels Singaporeans grew up seeing, the thermos features the nostalgic print. Lug this along for your morning coffee. 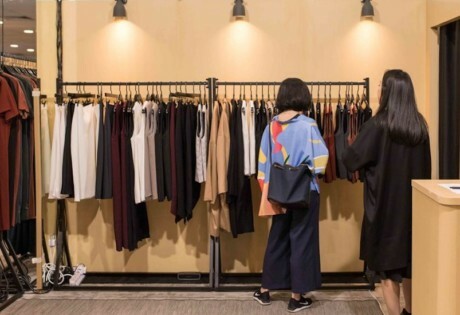 The lovely thing about Singapore Trading Post’s store at Tan Boon Liat and e-store, is you can leave with something special without buying something precious. 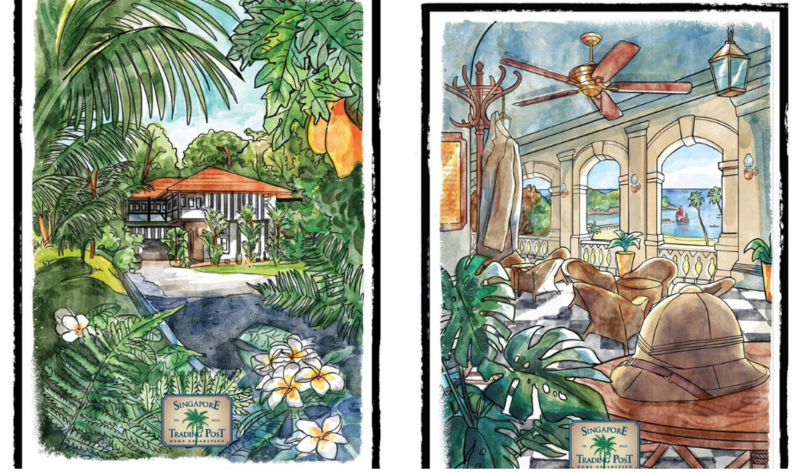 These beautiful tea towels depicting scenes from Singapore’s hay days are just darling, aren’t they? 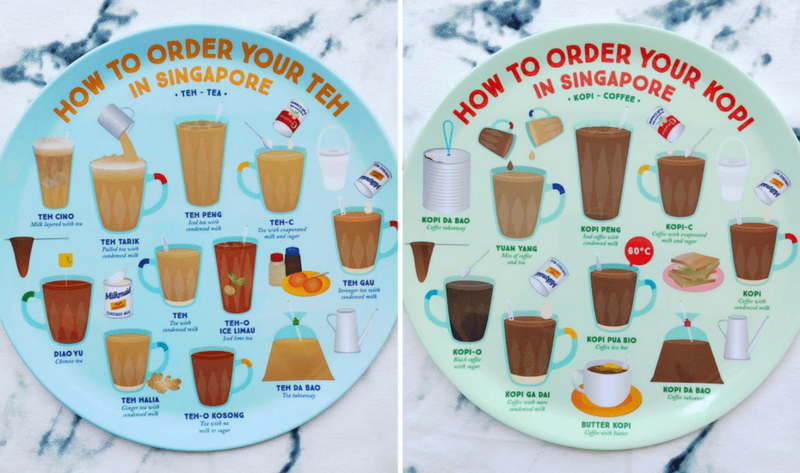 It’s humanly impossible for Singaporeans to survive a day without kopi or teh. Okay, we’re exaggerating but only just. There are countless ways to order a cuppa and you simply need this decorative plate to profess your love for the beverage. This one’s for the one true fan. This gorgeous piece of art comes all the way Paris where graphic designer Charlotte Chab handmakes each one. 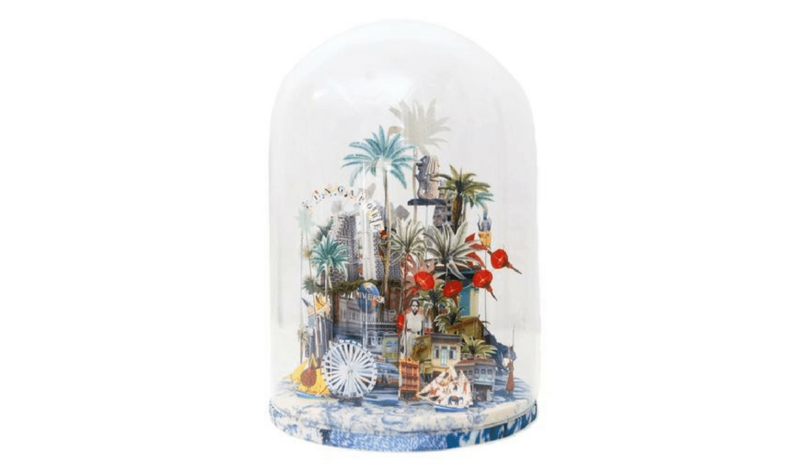 A stunning diorama in a dome, it features the most iconic bits of Singapore – Marina Bay Sands, Universal Studios and the Merlion alongside palm trees, shophouses, HDBs and food courts. Stylodeco stocks them in limited numbers and it’s not priced like souvenirs magnets – you’ve been warned. Classy, Asian and downright stunning, this two-toned Vietnamese lacquered tray on natural rice husk fibre is perfect for your parents. 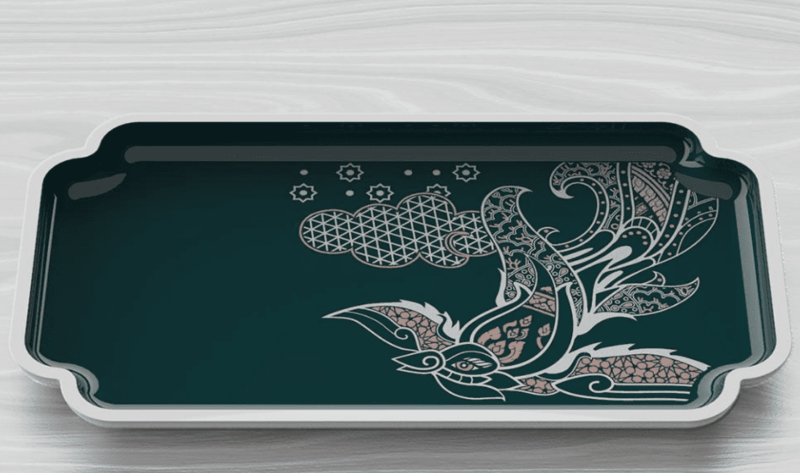 And it comes with a mythological story – the forest green tray has an illustration of Garuda – a legendary bird that appears in Hindu and Buddhist mythology that stands for knowledge, bravery and power. Loco for Singaporean food? Can’t resist a good (or bad) pun? 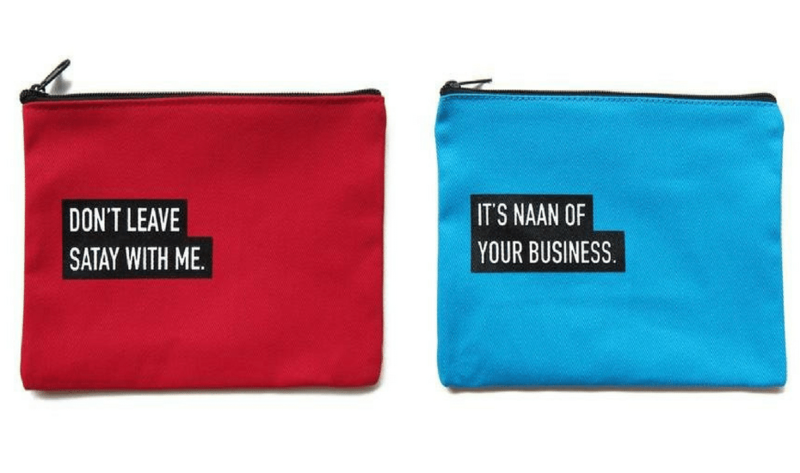 You need to bag these cute food themed punny punches right now. Wear your love for satay and chicken rice on your sleeve…no really on your actual sleeve. 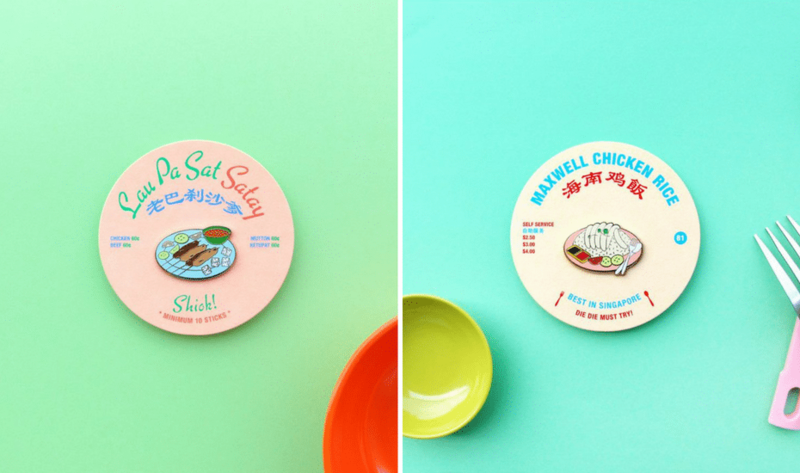 These adorable brooches featuring local delights will leave you with fond memories and massive cravings. Binary Style’s prints are incredibly unique – take the one inspired by Little India. Reflecting the district’s rich atmosphere, it features a sumptuous palette of deep purples and greens, fortune-telling parrots, peacock feathers, and the precinct’s famed windows. 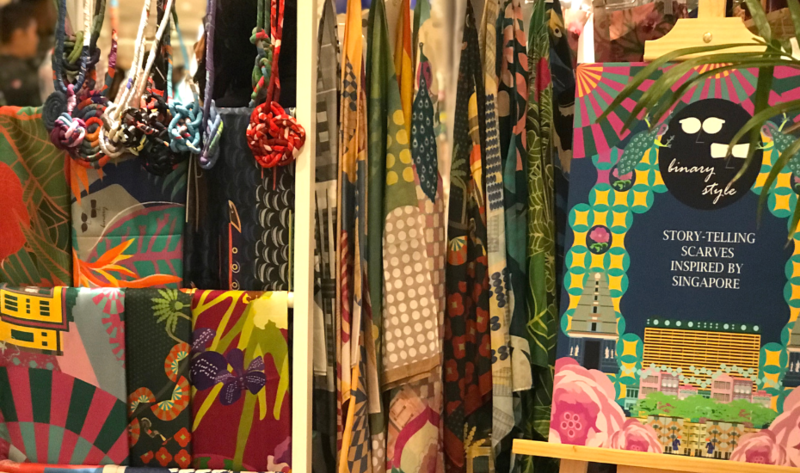 Other prints include the edgy Haji Lane scarf with bright colours and shophouse facades, and the blooms and butterflies of Singapore. You can’t possibly leave Singapore without a snapshot of the ubiquitous Singapore HDB. And if you’re local, you might want to hold on to this piece of crockery for old times’ sake. SuperMama’s HDB Series Rochor Centre pays homage to the icon that’s being demolished this year. 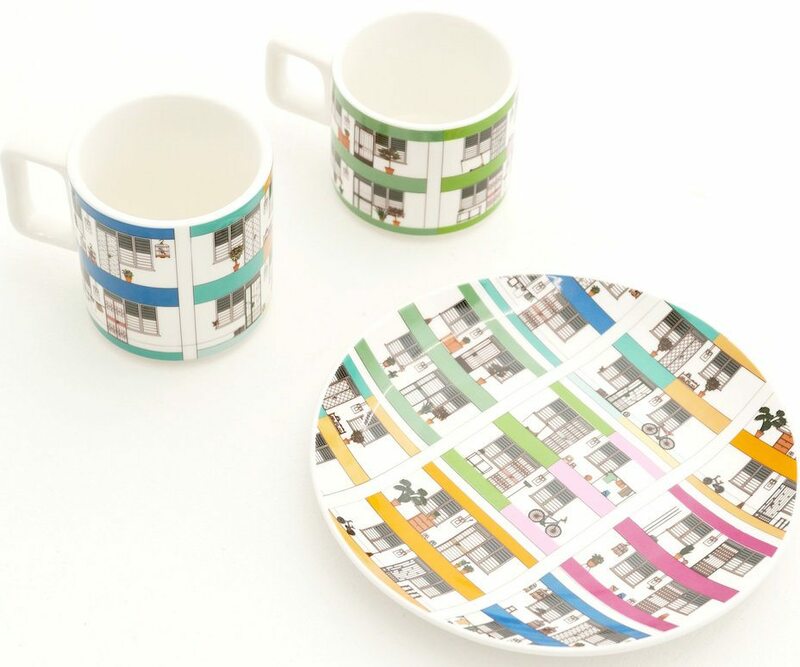 The building’s renowned architecture finds its way on new bone China plates and mugs in cheery colours and colourful spirit. SuperMama, Locations in Beach Road, Gillman Barracks and Wheelock Place. Now this is an umbrella you can’t lose. 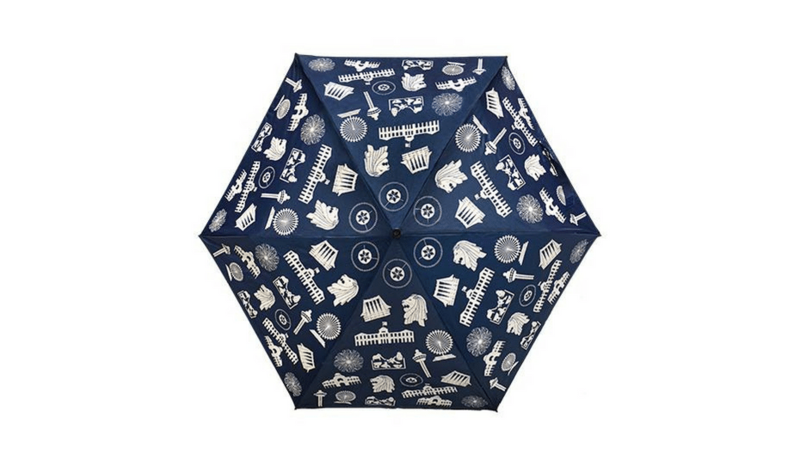 Brighten a rainy day with a cool umbrella – specifically, Now and Then’s rendition which features iconic Singapore architecture. 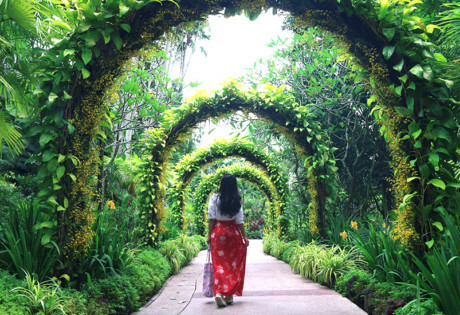 Motifs of landmarks include the Istana, Singapore Arts Museum, Changi Airport and Gardens by the Bay. Onlewo is famed for its bespoke home decors and wares which feature familiar Singaporean motifs inspired by the city’s heritage. We love the cushion covers for a lightweight gift. 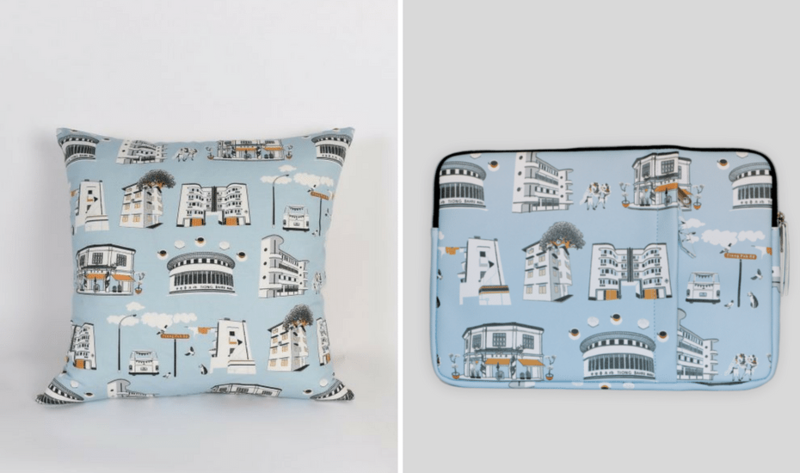 The ‘Tiong Bahru’ cushion cover and laptop sleeve make a stylish addition to any home, and were the artist’s tribute to his childhood growing up in the pre-war art decor houses. It’s a little offbeat, but if you’re one for quirky accessories, you’ll love ThePigBakesClay’s rings. 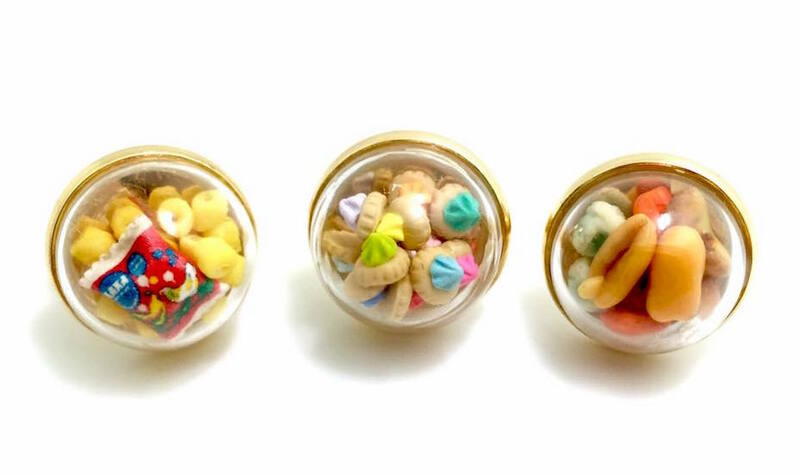 The globe rings ($34.90) are available in assorted designs, but for one that truly gets at the heart of #locallife, you’ll want ones filled with miniature gem biscuits or Haw Flakes – two childhood snacks Singaporean kids grew up with. 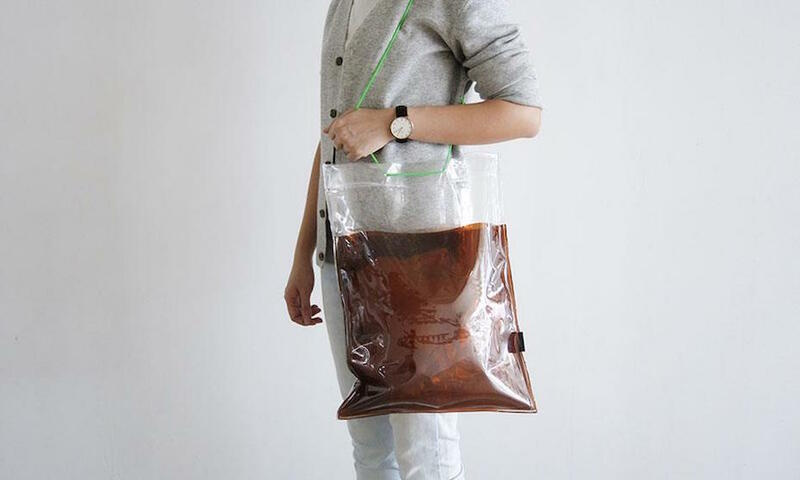 Make your love for Singapore kopi eternal with WhenIwasfour’s extra large tote bag version. The interchangeable straps which come with the tote bag are available in green or pink. The bag even comes with a straw like your everyday kopi. We’re going to come out and say it: anything printed with the Merlion usually borders on tacky, but we’ll make an exception for the adorable coasters by The Farm Store. 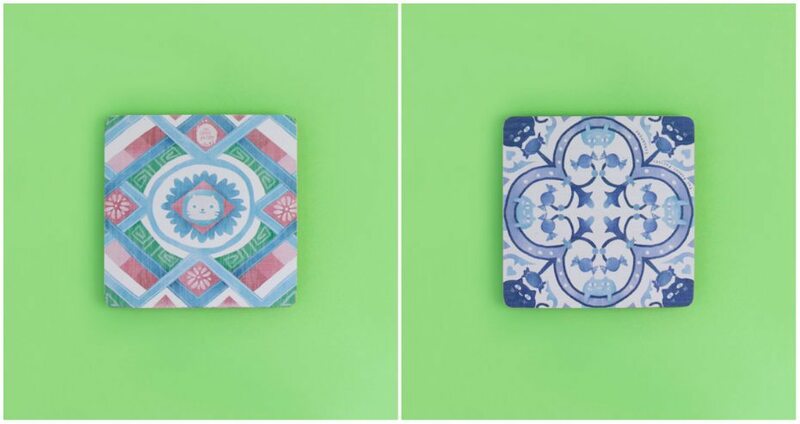 The wooden coasters feature vibrant prints inspired by Peranakan tiles, with the small face of the Merlion at its centre. Mix it up with coasters of other prints. 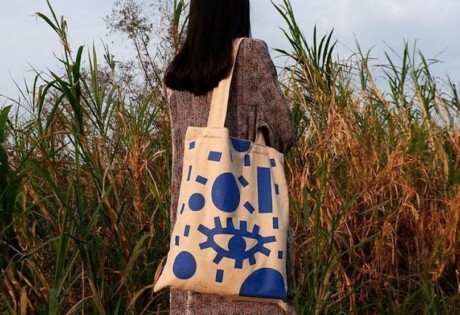 They say eating is a Singaporean’s favourite past time, so what could be a better symbol of this than this Fevrier Design tote bag? 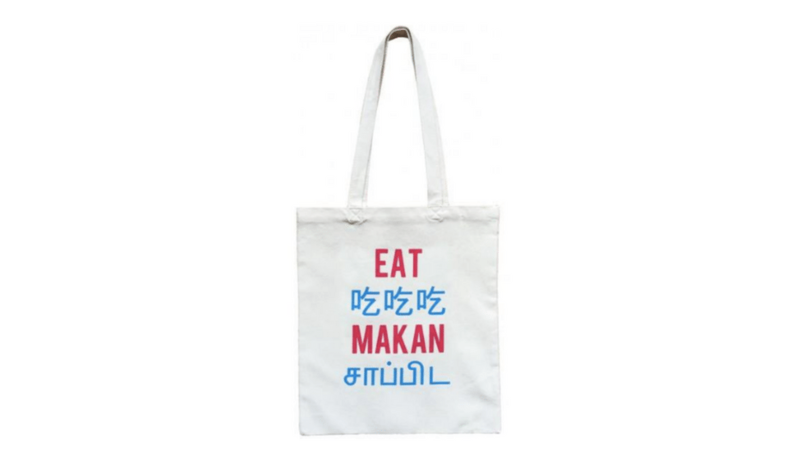 The perfect size to lug all your accessories, the word ‘eat’ is printed in all of Singapore’s national languages.